Similar to write the room or count the room, is Add the Room. 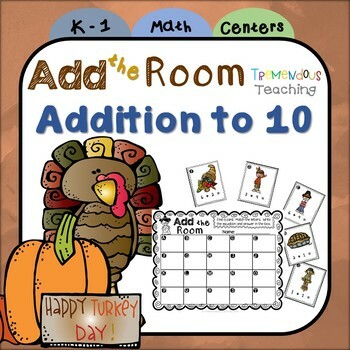 Included in this Add the Room - Thanksgiving Math Themed - are 20 cards addition up to ten. 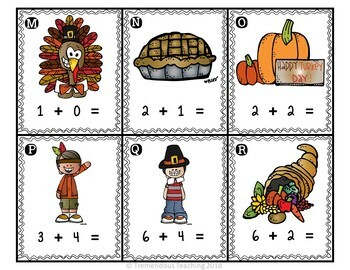 Print, cut and laminate the Happy Thanksgiving math fact cards and place around the room. 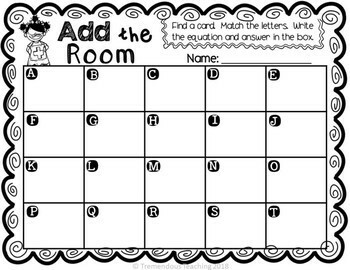 Print a recording sheet for each student and have them walk around the room solving math equations and having fun! This would make a great Thanksgiving feast day game or activity. The cards you place around the room have pictures of Thanksgiving turkeys and various Thanksgiving related items such as: Pilgrims, Native American Indians, a scarecrow, and Thanksgiving dinner.